After failing to retrieve his funds from MtGox in early February 2014 and being unable to get any meaningful customer service, Kolin Burges flew from London to Tokyo to visit MtGox to find out what was going on there and why his money was being held. On arrival he visited the MtGox offices and was refused his request at reception to speak to the CEO Mark Karpeles. He then requested to speak to anyone at the company and was refused. By that time his plight had already grabbed the interest of a reporter from the Wall Street Journal, who had accompanied him on this visit. That evening he met another MtGox customer Aaron who was in a similar situation and a reporter from CoinDesk, and the next morning Friday 14th Feb 2014, Kolin and Aaron began to protest outside of the MtGox office with the Wall Street Journal and CoinDesk in tow. The initial aim was to speak to the CEO as he arrived at the office because this was the only avenue open to them to communicate with the company. When Mark Karpeles came along Kolin’s requests for the return of his bitcoins were unsuccessful, as were his questions about whether MtGox still possessed everyone’s bitcoins. However the confrontation was filmed by the journalists and when the videos were published on the news sites they brought a whirlwind of attention. 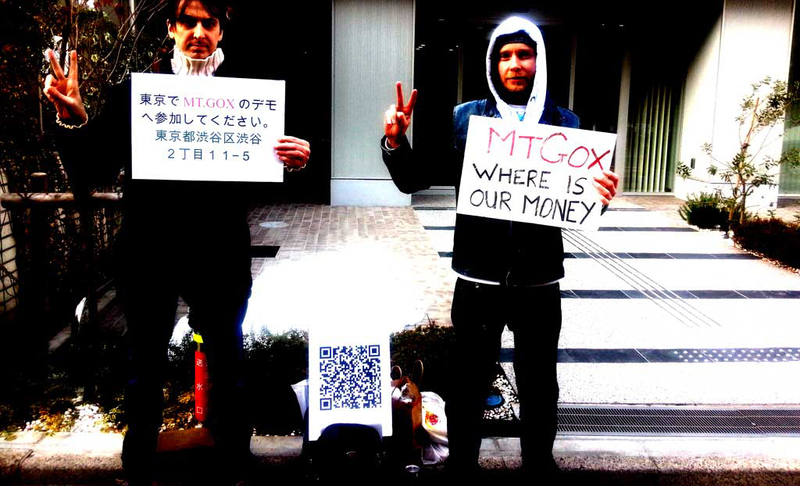 Thus began the MtGox protest and its support from the community. By the end of the day the Financial Times and NHK World had been to the protest site and the buzz on the internet had led to hundreds of messages, many donations, and even an offer of a place to stay. A great deal of media attention was received over the next few days, with many of the world’s most influential newspapers, magazines and TV stations turning up to cover the story. Over time the protest became more high tech, with the focus shifting from protesting to communicating with the media and the bitcoin community. A live webcam introduced on Wednesday 19th Feb began bringing in several hundred simultaneous viewers and Aaron began his new role doing live video Q&A with the internet. Kolin was focused on social media, emails and contacting the media. On Friday 21st Feb, visitors to the protest had reached a new peak, both from the media and from the bitcoin community. The police were called to break up the gathering, which at the time had temporarily ballooned into a friendly, non-protesting group of 10 people. On Monday 23rd Jan, unable to continue the protest in the same form without fear of arrest, Aaron and Kolin explored new technological and logistical means to get around the police ban. But the following day MtGox.com went dark, and over that week MtGox collapsed. Over half a billion dollars worth of customer deposits were gone.